Aside from the freshness of the roasted beans, the quality of the grind of coffee is one of the most integral parts of creating the best possible cup of Joe. Consistency is key in brewing an excellent cup of coffee, and the uniformity of the coffee grounds is vital. A person can be using a top-of-the-line espresso machine, but if the beans are poorly ground then the result is still going to be sub-par. 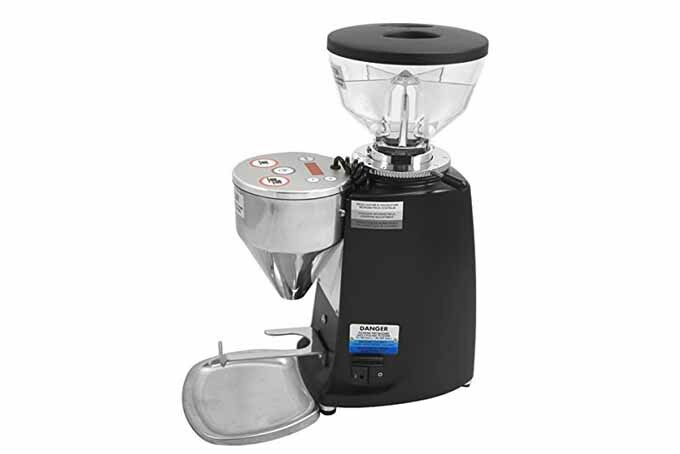 As with many of the different pieces of coffee paraphernalia, choosing and buying a coffee grinder is relative based upon a number of factors. Personal preferences, budget, and frequency of use are all taken into consideration when shopping for a quality machine. This introduction is just that: and introduction. 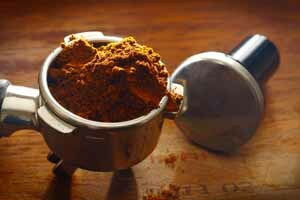 For a more in depth look, you should also read Foodal’s Ultimate Guide to Purchasing a Great Coffee Grinder. 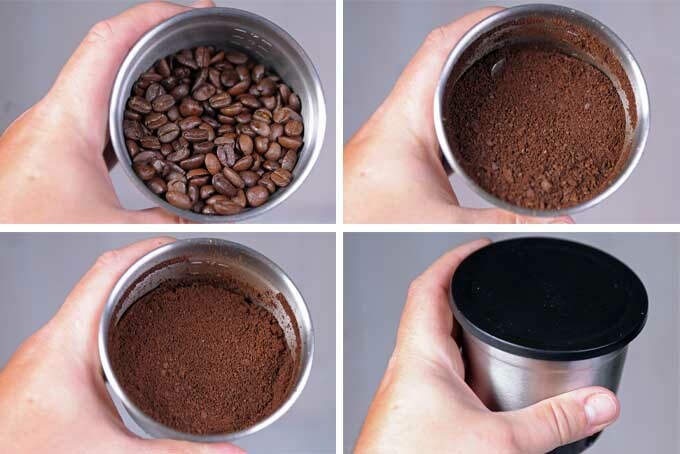 There are three basic types of coffee grinders available. The first is a blade grinder; these are generally cheaper and because the grinder continuously chops the bean up as it is ground, a very inconsistent grind is usually the result and often the flavors of the brew are not optimal (although still better than pre-ground from the store). These are generally recommended only for spices. 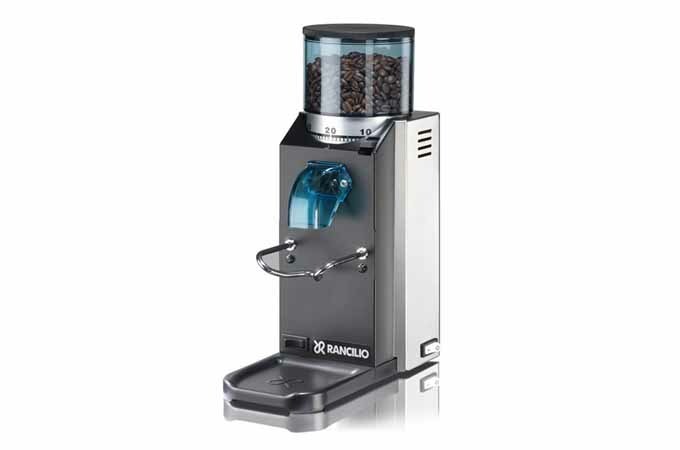 The second type of grinder is a burr grinder and these grind the beans at a much more consistently and often feature commercial quality parts. Burr Grinders can be found with conical burrs or flat burrs. These are usually more expensive and are often larger (but not always). Some burr based units are made for multipurpose use and are adjustable are capable of grinding from a coarse French press grind to a fine powder needed for Turkish coffee. 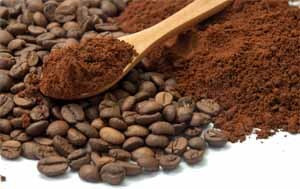 A subset of the burr grinder is an Espresso Grinder; Espresso must be ground at a much finer and at better consistency than that needed for drip coffee or a french press grind. Dedicated espresso models are general better than regular coffee multipurpose products for grinding exclusively for espresso. Whether used at home or in a commercial setting, there are some definitive aspects to look for in any grinder you are considering. First of all, there are two types on the market: burr grinders and blade grinders. Due to their inexpensive price tag, blade models are often quite popular. However, even for brewing at home, beans ground through a blade will simply provide a sub-standard cup. Because the blade chips and chops at the beans, there is no ability to guide the grounds evenly, meaning that large chunks and small shavings can co-exist. Ultimately the beans often end up simply sliced and crushed. This type of unevenness prevents the possibility of pulling out the best flavor, no matter what method of brewing used. 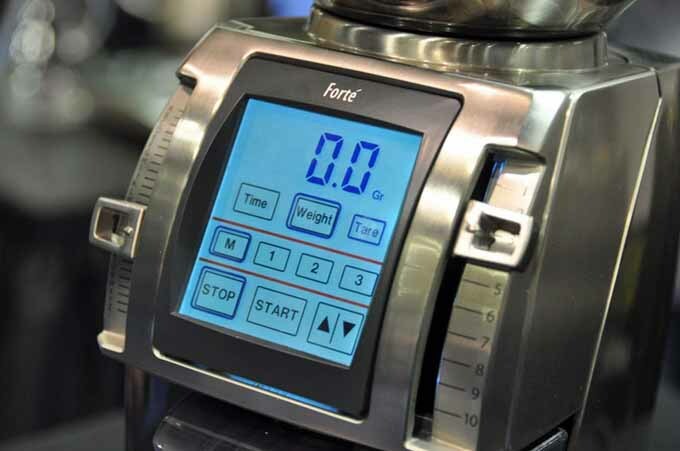 A burr model, on the other hand, provides the user with the ability to control the fineness or coarseness of the grind, creating an even and flavorful beverage. Burr-based machines use rough, sharp discs or cones which resemble burrs found in nature. Because of the way the machine works, the rough balls or discs are able to shave the beans without crushing them. You can read more about why you don’t want a blade type model here. There are few coffee grinders capable of grinding from a coarse French/Vacuum Press to a Fine Turkish Powder. Since these grinders are multi-function, they do not excel at doing both tasks but do produce decent to good results at both ends of the spectrum. They are an excellent beginner’s grinder and some of them have commercial level parts. Unless you are a true coffee and espresso aficionado, you may never have to upgrade from this level. Grinders that are dedicated to the grinding at the grind consistency required of Espresso. They generally do a better job than that of adjustable all purpose burr type coffee grinders as they are more consistent and leave fewer fines. Moreover, they are faster and almost all of them feature commercial level quality. They can be use to for other brewing methods as well but cannot quickly switch back and forth like the multipurpose models. • Cone vs. Flat. Within the burr category, there are some design varieties in different models. Some designs use flat, disc-type burrs while others are made with conical shaped burrs. Machines that use a cone-shaped design are often more able to minimize heat because of the larger surface area, so they can spin more slowly. On the other hand, appliances containing the flat, disc-shaped burrs often include other ways to dissipate heat so that it does not affect the flavor of the coffee. • Steel vs. Ceramic. 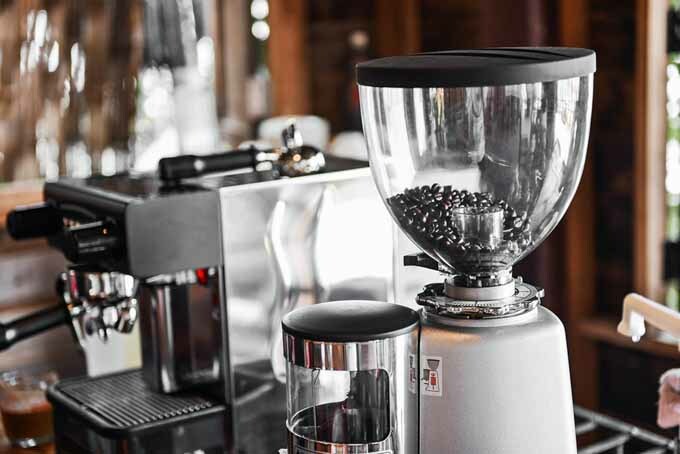 Busy coffee shops often prefer a high quality stainless steel grinder, simply because they are able to withstand some damage if there happened to be a rock or some other offending object mixed in with the beans. On the other hand, unless they shatter from hitting a foreign object, ceramic burrs are longer lasting, plus they give fantastic texture for espresso brewing. • Stepped vs. Stepless. The size of the particles is determined by the nearness of the burrs to the grinding plate. Stepped grinders, which are often less expensive, use a knob to change the setting by clicking it into the next step. A good quality stepped grinder might have a range between 40-80 steps to offer grinder from a medium coarseness to powder fine for Turkish coffee. Stepless adjustors, which are often placed on higher-end machines, are more fluid in adjusting the fineness or coarseness of the grounds. This can be beneficial, but can also make it a little more difficult to get exact settings when switching back and forth between drip and espresso. • Doser vs. Doserless. The way that the ground coffee is collected varies depending on the machine you choose. For those strictly using espresso machines, grinding directly into the portafilter means that you are not using a doser or filter basket. Some professionals feel that this is preferable because it is one less step to put the coffee into the portafilter. But doserless baskets are found to be rather messy as they often cause a spray of grounds to be left around on the counter. • Power. 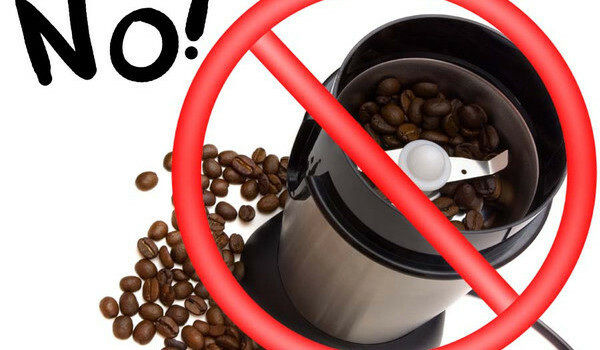 The power of a coffee grinder usually ranges from 150 watts to 300 watts, depending of the quality of grinder you purchase. In this case, more power usually means that you will better results and the motor is less likely to burn out. While you can spend (or waste?) $20 on a blade grinder at your local department store, you really won’t do much better than simply buying your coffee pre-ground. For a mid-range, at home, multi-purpose grinder, consider investing between $200-$500. A professional grinder for a coffee shop will run up to $2000 or more, depending on the needs of the business. This investment in a grinder is a sound one, which will make the difference between average coffee and top-of-the-line beverages. 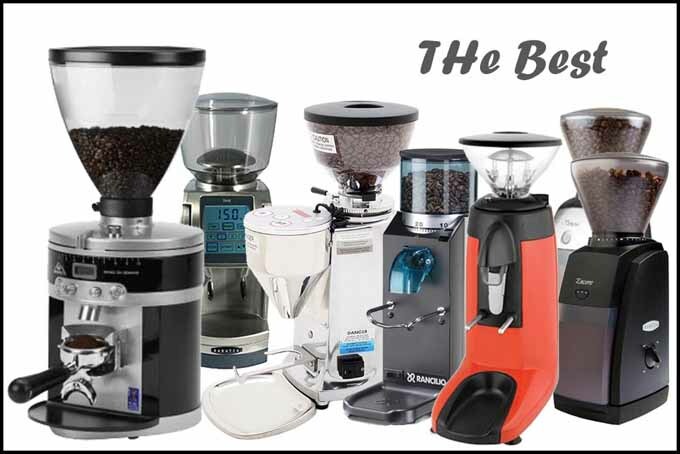 Take a peek at our coffee grinder buying guide or read an in depth discussion of our top rated models and see more tips down below. 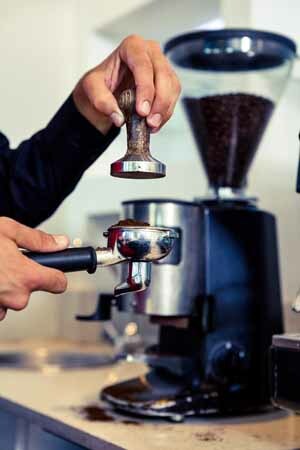 Are you trying to get a grasp on all of the options available to you when it comes to coffee and espresso grinders? If so, give our very detailed guide a read and learn all that you need to know. 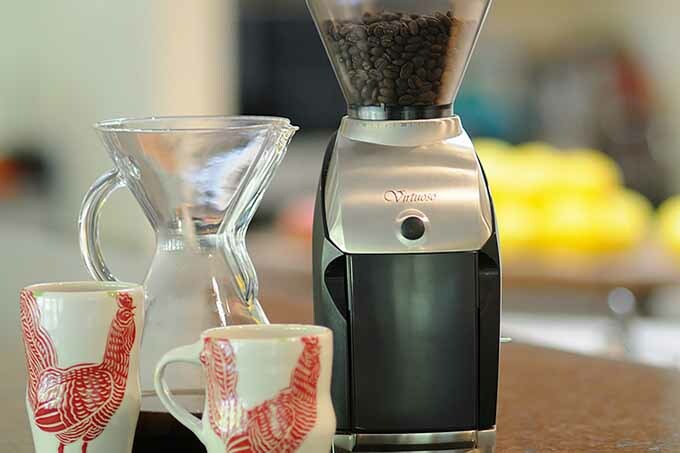 Looking for a grinder for your first foray into home coffee bean grinding? Or a second grinder as a travel companion or to brew your spouse’s flavored beans? Then a blade model may fit the bill. Learn what you need to know about these little chopping and grinding gadgets now. 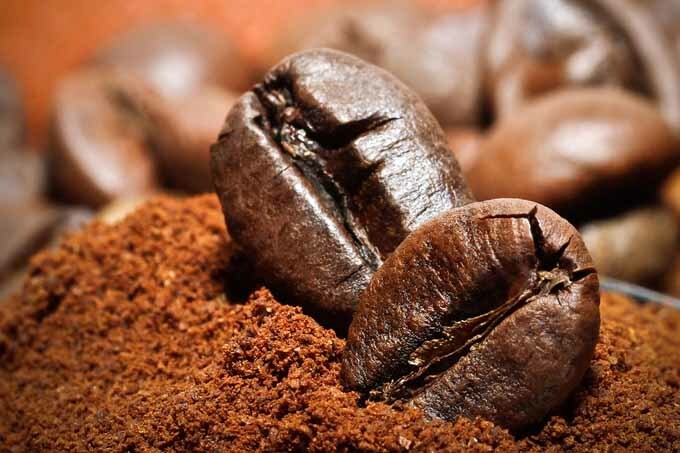 You may not realize it, but how and where you store your coffee beans has a direct impact on their lifespan. Read our tips to increase the longevity of your beans. This will allow you to save some cash, and you’ll be able to purchase in bulk – thus keeping your supply fresher for longer periods! Many folks make the mistake of buying a blade grinder as their first foray into the world of premium home coffee brewing. Read why this is not a good idea, and how to pick a grinder that will keep up with your expectations. The Baratza Vario-W Grinder features 230 different grind settings, Swiss-made 54 mm ceramic burrs, and weight-based grinding for accurate dosing. Read more about this fabulous machine now. Available in two different models, the forte is THE BEST multipurpose coffee grinder on the market. With it’s ability to weigh your grounds built on board, tough aluminum, stainless steel construction, and Baratza’s legendary support, you can’t go wrong with this model. Read more now. The Baratza Vario is a perfect ” do it all” grinder do to its 54mm burrs, a strong motor, & the ability to switch between espresso & drip grind. Read about it now. The Baratza Virtuoso features a timer and 40 settings from a coarse grind to very fine for espresso; a powerful 6 Amp motor reduces grind times. Read about it now! 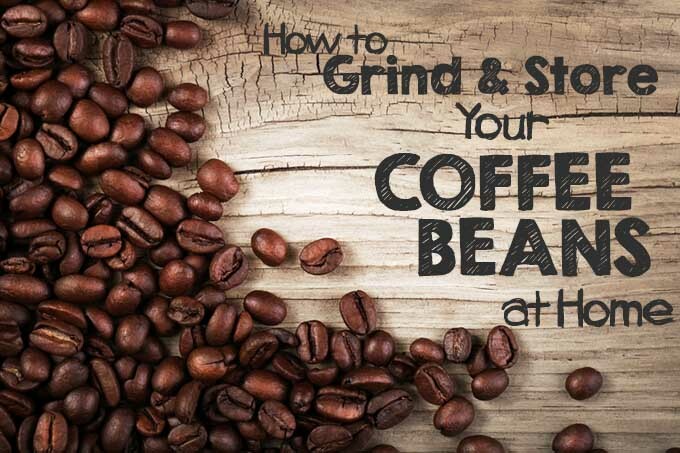 Coffee fans know that a perfect grind is the key to success and this home grinder helps deliver the results for most of your brewing needs. This particular machine is built like a tank but it is not without it’s drawbacks. Read more now to find out its pros and cons. Getting the best brew out of your coffee requires juggling some variables and one of the most important of these is the size of your grind. 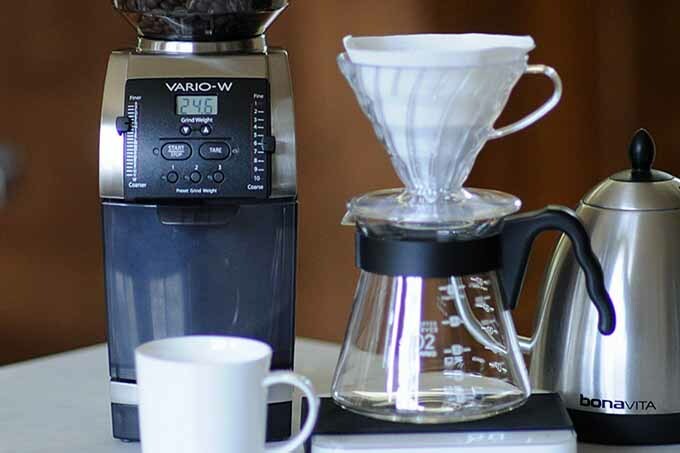 Read our guide to help you select the right size for your application whether it be for a French Press, automatic drip, or a pour over. Looking for one of the best machines to grind your espresso beans? One that doses the exact amount of grinds each time to ensure that perfect repeatable shot? 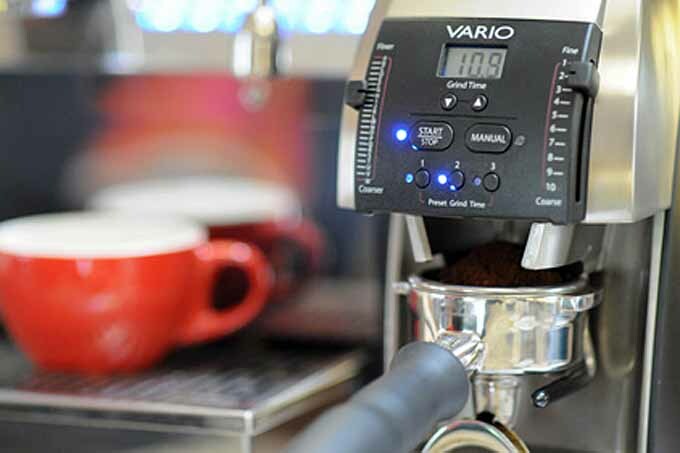 Look no further than the Mazzer Mini Electric Type A. Get the scoop now! The Mahlkonig Single K30 Vario is the perfect machine for espresso thanks to its precise adjustment capabilities, grind on demand capability, and 65mm burrs. Read more about this top rated product now.